If it is true, the model of Apple (iPad mini), has an attractive design with good materials like aluminum and a thickness well below its competitors: 7.2 millimeters. Meanwhile, the model of Samsung (Samsung Galaxy Tab 2 7-inch) with a thickness of 10.5 inches, nothing excessive or annoying to carry around all day. Furthermore, the weights do not reach 400 grams in either cases. Furthermore, the screens are multitouch both iPad mini as the Samsung Galaxy Tab 2. Although the size of the two is different: the seven-inch and 7.9-inch Korean model model Cupertino getting a maximum resolution of 1,024 x 600 pixels in the first case and 1,024 x 768 pixels in the second. The tablets of the moment are teams capable of being connected to the Internet for hours. And in many ways: both high speed WiFi points as 3G mobile connections. Both Apple and Samsung are betting on two different versions: a model that includes only WiFi and another version that combines WiFi and 3G. 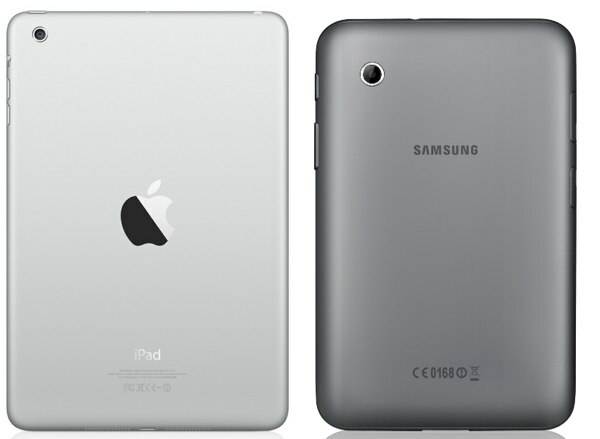 Meanwhile, the Bluetooth connection will be present on both the iPad mini as the Samsung Galaxy Tab 2. With this technology, both tablets can connect to compatible or transfer files to different computers: computers, mobiles and other tablets. In addition, Samsung Galaxy Tab 2 will share material with other wireless devices using the AllShare feature. But Apple and its iPad mini are more closed. And to use your AirPlay, you must have another computer at home over Cupertino: Apple TV. Otherwise, if you share material, with a TV, for example, the customer must be made with a special adapter. Meanwhile, in the section of cable connections, Samsung Galaxy Tab 2 provides the ability to insert MicroSD card, use a microUSB port for syncing and battery charging and listening to music through the standard audio output of 3.5 mm . Also, the iPad mini offers only the ability to connect your new connector Lightning, in charge of feeding the battery and sync with a computer. Finally, while the Samsung Galaxy Tab 2 will offer a GPS receiver in all versions, the iPad will have it available only mini-as usual-in version that combines WiFi and 3G. Both models offer several cameras: one front and rear other, which will be the principal. None of them integrates Flash for darker scenes. 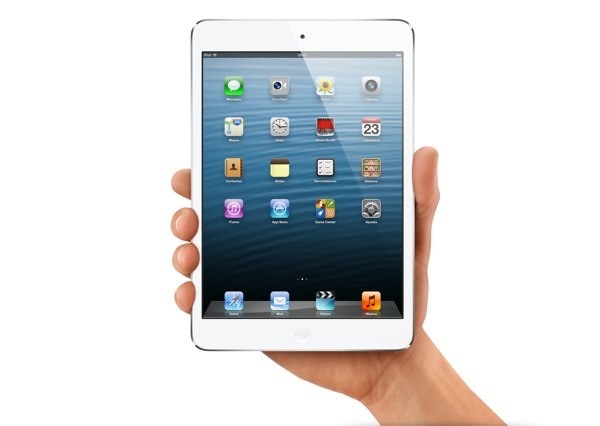 To empzar, iPad mini offers a 1.2-megapixel front camera with which can make video calls in HD 720p up. 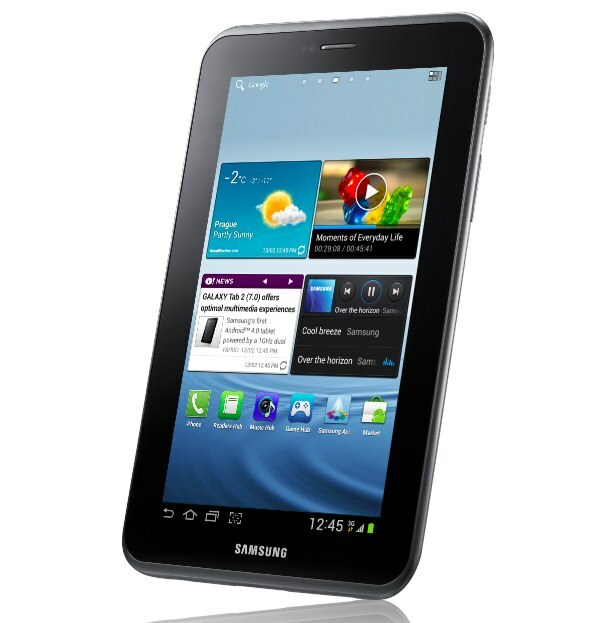 Meanwhile, the Samsung Galaxy Tab 2 also offers a front camera but with a resolution of 0.3 megapixels (VGA). Also, in the back of the iPad mini sensor is larger and get higher resolution, five megapixel capable of recording videos in full HD 1080p. 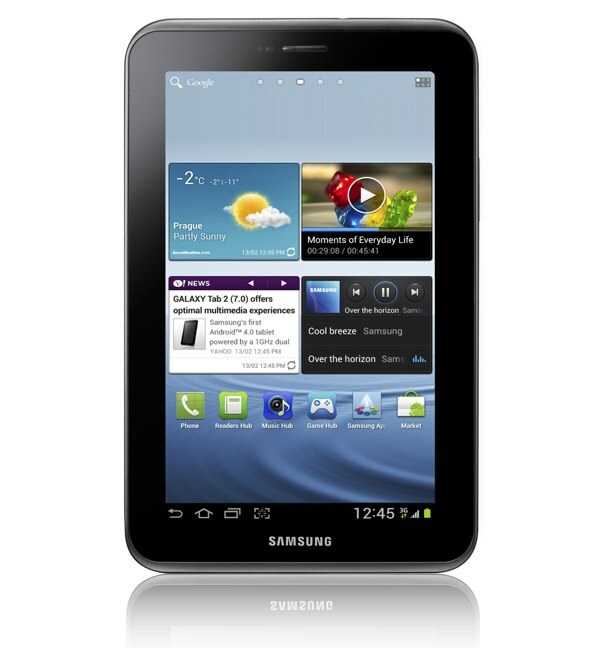 The Samsung Galaxy Tab 2 features a three-megapixel sensor and can record videos in full HD with a rate of 30 frames per second, resulting in the movement of natural images. Meanwhile, in the RAM, the iPad mini offers 512 MB ​​and the Samsung Galaxy Tab 2 features a GigaByte. The same applies to the size of the internal memory. 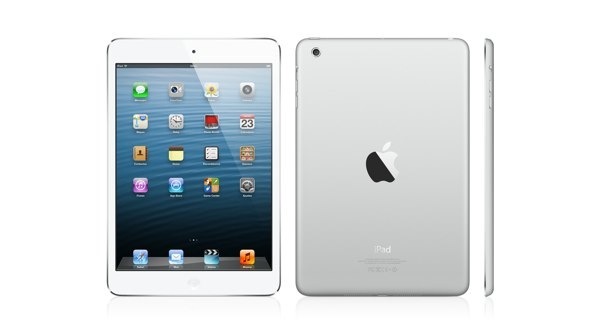 The iPad mini will be available in 16, 32 and 64 GB, while the Samsung model is available in 8, 16 and 32 gigabytes. But yes, the Samsung Galaxy Tab 2 offers the possibility of increasing this capacity with MicroSD cards up to 32 gigabytes. In other words, move files to the Samsung model is simpler and would not need to use a computer program. This section is where the differences are greater. The mini iPad offers Apple's own platform: iOS 6, while the Samsung Galaxy Tab 2 is based on icons from Google in its Android version 4.0. In this there will be for all tastes and who can have the most comfortable the Apple operating system. And others who, by their use, prefer the seamless integration of Google services on the tablet from Samsung. Mind you, we must bear in mind that for now Apple has not solved the problems that arise in version iOS 6 , while for months Samsung included in its roadmap, the Samsung Galaxy Tab 2 as a candidate to receive the version 4.1 Android Jell Bean, a bonus that will make this tablet-even-move more freely and receive new features and, above all, new graphical look at the Samsung TouchWiz user interface. In addition, both models offer a wide range of applications that you can download from different online stores. Also in the interior of both models with preinstalled applications will be able to take full advantage. IPad mini offers the ability to purchase e-books, surf the streets and roads, as long as the Cupertino solve the issue of system maps operating or power-talks through iMessage chats with the program. Another of the aspects to consider is the final price of the models. And is that the iPad mini part from a price well above the competition. And compared to the case of the Samsung Galaxy Tab 2, the price is 80 euros. The cheapest version of the Samsung model of the 250 euros. While the iPad mini journey starts from EUR 330. 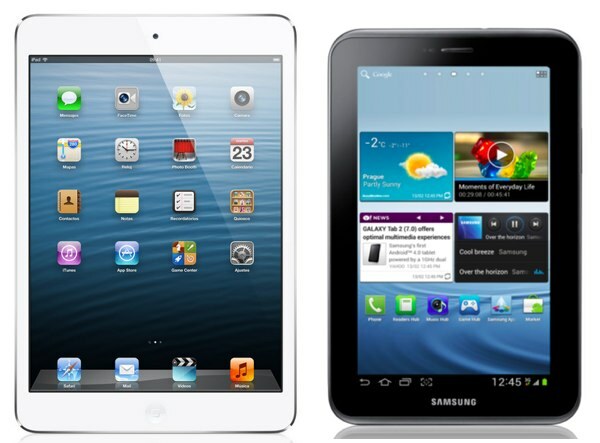 Size is not the same: 7.9-inch iPad mini in front of the seven-inch Samsung Galaxy Tab 2. But the power of both models is very similar, getting to have Samsung team twice of RAM and a processor with the same characteristics. Meanwhile, Apple has released a model with technology-so to speak-rather outdated way: a model manufactured in facilities like the iPad 2 but smaller in size. Moreover, although it had also hoped Retina display, finally not the case. Hence the rumors jump out and say from the outset that the second generation of the tablet would be outside the sales catalog . However, the price is a compelling reason to opt for one model or another. And Samsung Galaxy Tab 2 is cheaper: 80 euros to be exact. In addition, integration with Google services is perfect and makes it ideal for users who are intensive consumers Gmail, YouTube, Google Docs or even Google Calendar without using third party applications.